Product categories of Industrial Media Converter, we are specialized manufacturers from China, Industrial Fast Media Converter, Industrial Fast POE Media Converter suppliers/factory, wholesale high-quality products of Industrial Gigabit Media Converter R & D and manufacturing, we have the perfect after-sales service and technical support. Look forward to your cooperation! Industrial media converters to connect Ethernet over fiber.For applications where you need to convert between 10/100BaseTX or 1000BaseTX and fiber, N-NET supply a range of industrial Ethernet to fiber media converters (POE optional). Designed for use in harsh environments, our range of Ethernet media converters support 10/100/1000Mbit copper and 100/1000Mbit multimode or single mode fibre connections. All of our media converters provide Far End Fault Indication (FEFI) in the form of auto Link Loss Forwarding (LLF) to ensure link status changes are forwarded on. 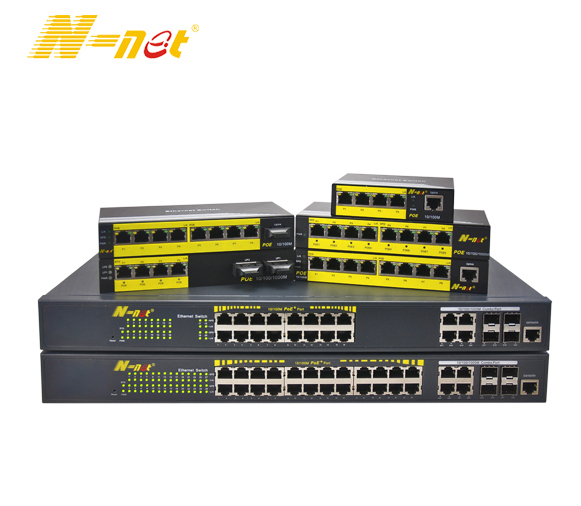 Support L2+ Switching features including 802.1Q VLAN, Mirroring, Port isolation, IGMP Snooping, DHCP Snooping, LLDP, POE+ management, IP Source Guard, ARP inspection, ACLs etc.